Frank Tubb was a building contractor in Santa Ana with an interest in the archeology of Orange County. He had already discovered a 17 million year old fossil Whale in Mission Viejo during the construction of one of his housing projects. He was intrigued by the Laguna Skull, and had contacted Howard to see the skull for himself. Through an odd coincidence, he was also an old friend of Dr. L.S.B. Leakey, who, as it happened, was also in Newport Beach on a lecture tour that week. Dr. Leakey was considered the dean of contemporary Anthropologists, having discovered man's earliest ancestor, 2 million year old Homo Habilis, at Olduvai Gorge, Tanganyika in 1960. Tubb called his old friend Dr. Leakey and asked him if he'd like to see the skull too. Leakey, often inundated by locals bringing old things for him to see during his tour, usually would turn down such a request, but he decided to look at the skull for the sake of his old friend. Howard took the skull to Balboa where Leakey was staying with friends and was told by an assistant there that the DR's schedule was so busy and that he could only spare 10 minutes. Howard entered the room and produced the skull. "He took one look at the skull and began grinning 'Oh! Gee, that looks great!' he said. I thought I'd never get out of there." said Howard later. 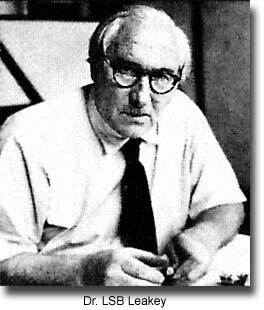 Leakey apparently instantly recognized the possible significance of the skull, and became so interested in finding out it's true age, that he asked Howard if he might take the skull to the Geophysics lab at the University of California in Los Angeles to have it dated using the now very precise method of Carbon-14 dating. In fact, it would be dated by the very scientists who invented the C-14 method of dating, Dr. Willard Libby and Dr. Reiner Burger. If anyone in the world could find the most precise date possible, using the most accurate lab procedures, it would be these two men. Howard agreed to the dating and handed the skull over to Dr. Leakey, then went home to wait. Ironically, just during the preceding year, Howard had offered the skull to two prominent California Universities for examination: Both had turned it down. They would soon find out they had missed out on the most exciting discovery in American Archeology.